Join us for a monthly Tot Shabbat at Chabad. It is the perfect way to introduce your child to the joy of Shabbat through song, movement and creative play. For children ages 0-5 and their families. The Tot Shabbat program runs from 11am-12pm. Kindly RSVP to Chanishemtov@gmail.com if you will be attending. 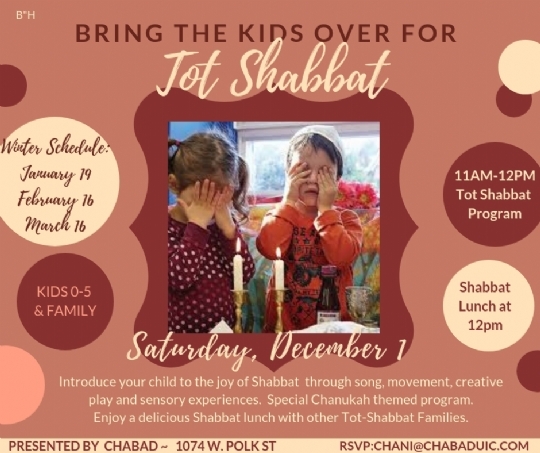 Optional: Join us for a delicious, relaxed Shabbat lunch following Tot Shabbat. Please RSVP.